Following a remarkable career that saw him go from a bench player to Hofstra’s No. 2 all-time scorer, Justin Wright-Foreman’s time with the Pride has come to an end. His athleticism and record-breaking scoring drew in fans both at Hofstra and around the country. The sixth annual Interdisciplinary Student Film Competition took place on Wednesday, April 3, at the Sondra and David S. Mack Student Center Theater. The Hofstra School of Health Professions and Human Services, in conjunction with the Hofstra Northwell School of Graduate Nursing and Physician Assistant Studies, hosted the event. Once a cult favorite, “Arrested Development” has become a household name. The show, which originally premiered on Fox in 2003, ran on the cable network for three seasons until its untimely cancellation in 2006. 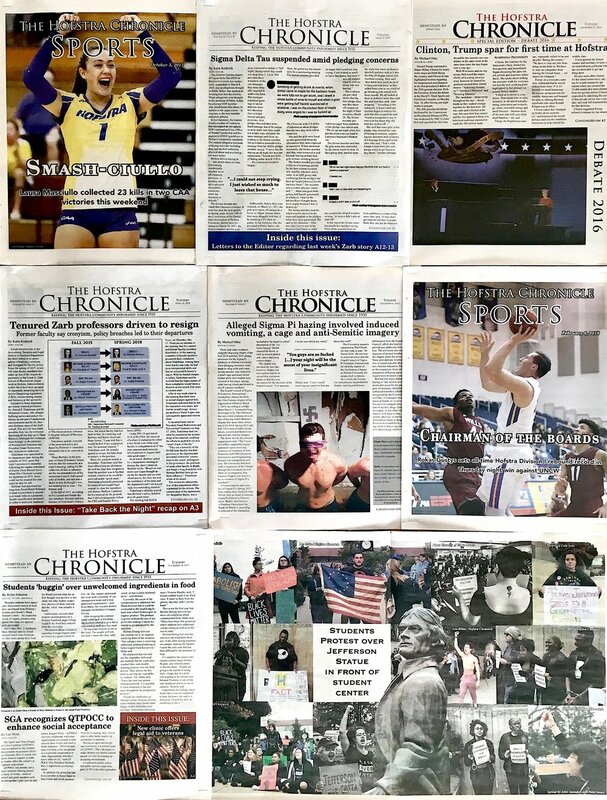 Check out The Hofstra Chronicle in print online! Miss one of our issues? You can find a digital version of every issue since Fall 2010 here! Meghan Giordano’s walk-off single in the seventh inning put Hofstra softball over Towson University for a 9-8 victory on Saturday, April 20, at Bill Edwards Stadium. The Hofstra baseball team won their fourth straight game on Saturday, April 20, with a 6-4 victory over the University of North Carolina-Wilmington Seahawks at University Field in Hempstead. On an overcast Friday, April 19, the Hofstra women’s lacrosse team lost 13-12 to the Towson University Tigers at James M. Shuart Stadium in their final regular season home game. The team was led by Alyssa Parrella, who tied a career-high seven goals and set a new single-season program record for points with 86. Also setting a record was Darcie Smith, who set the single-season school record for most draw control wins with 100. Thanks to significant help from the freshmen, the Hofstra baseball team defeated the UNC-Wilmington 7-3 on Friday, April 19, at University Field to kick off their weekend series. With the win, the Pride move to 9-24 overall and 3-7 in Colonial Athletic Association (CAA) play. The Seahawks fall to 20-19 and 5-5 in the conference. The Hofstra baseball team traveled to New Brunswick, New Jersey on Wednesday, April 17, and defeated Rutgers University by a score of 6-4. The Pride improved their record to 8-24, while the Scarlet Knights fell to 13-20. MLAX: Drexel holds on to top Hofstra on the road in their final home game of the season by the score of 13-12. MLAX: Joey Elarde now also has a hat trick in the game as he scores to make it 13-12 with Drexel holding the lead with 4:19 remaining. MLAX: Drexel takes their first lead of the game with just 8:14 left in the game. They lead the Pride 12-11. Type your letter to the editor below. Please note that The Hofstra Chronicle does not print anonymous letters to the editor except in extenuating circumstances. We bring you the important stories so you can stay informed about your community!